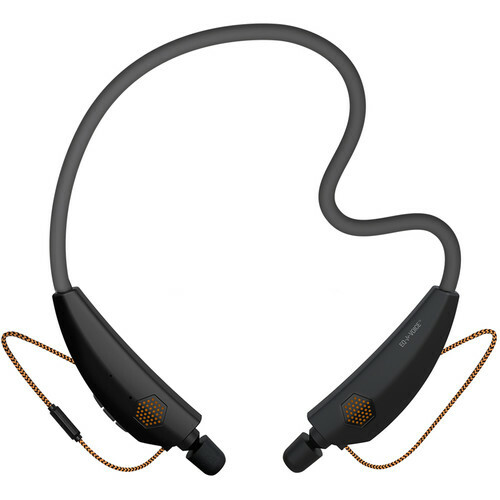 Enjoy two different listening experiences and a variety of storage options with the Flex ProComm2 Wireless In-Ear Flexible Neckband Headphones from ToughTested. With the Flex ProComm2 headphones, you can listen to your favorite audio via in-ear earbuds for a more personal experience or through the pair of built-in speakers when you need to interact with those around you. Either way, the Flex ProComm2 headset is made to rest comfortably around your neck and features built-in controls to manage your audio. When it comes to storage, the flexible and bendable neckband gives you a host of interesting options. You can wrap it around your wrist, twist them around a backpack strap or handle, or figure out an option that works best for you. The Flex ProComm2 are designed to wirelessly pair with Bluetooth mobile devices, such as a smartphone or tablet. When paired with your smartphone, you can utilize the built-in dual noise-cancelling microphones to enjoy clear conversations. ToughTested have included a built-in EQ-Voice equalizer and dual noise-cancelling microphones. Together they are designed to cancel out background sound, even in very noisy environments, to ensure that your voice sounds crystal clear on the phone. The Flex ProComm2 comes with two pairs of Flexfoam eartips and two pairs of tree-style eartips. They are designed to deliver passive noise isolation, blocking out unwanted sounds so you can better enjoy your music or podcasts. This neckband headset feature up to 15 hours of battery life for all-day use. When you need to recharge, simply plug in the included USB charging cable into a computer or (optional) charger. Controls are integrated into the neckband for your convenience. They give you the ability to quickly adjust volume, fast forward, skip tracks, and manage calls. Box Dimensions (LxWxH) 9.15 x 7.25 x 1.55"